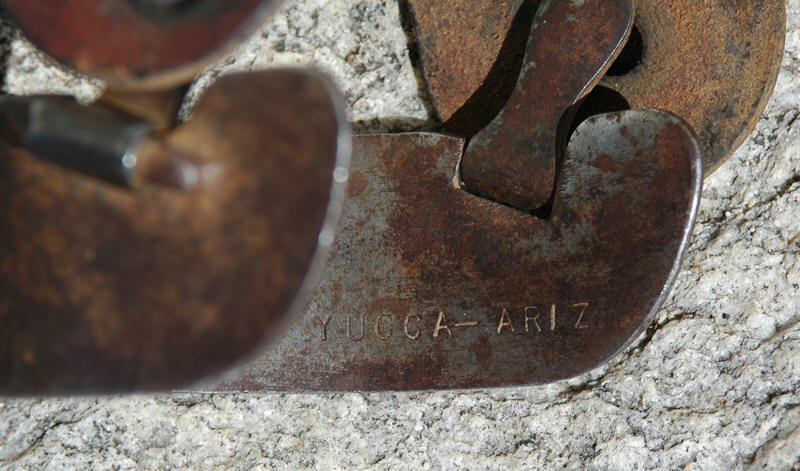 Blanchard spur photos and stories from our visitors. 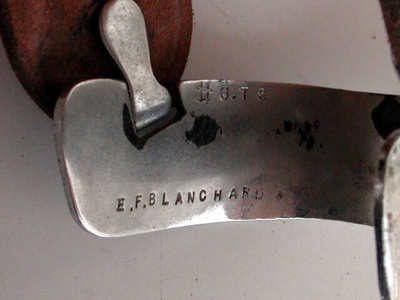 Below are several representative sets of Blanchard spurs. 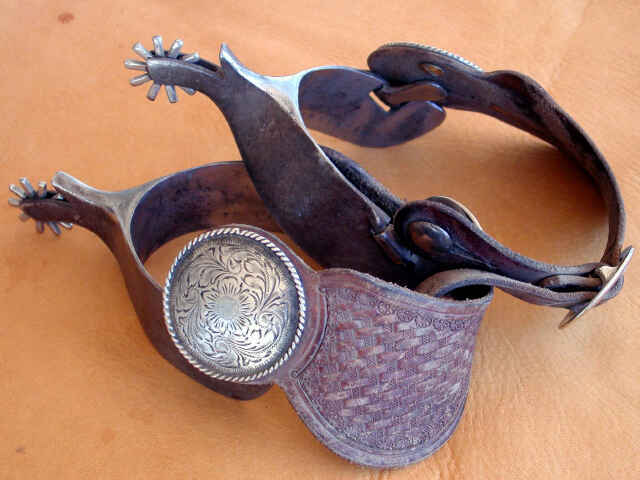 We appreciate all the calls, letters, and pictures from you folks that saw a version of this article in Western Horseman Magazine and those who have come here looking for history and validation. Some of Blanchard's earliest spur work. 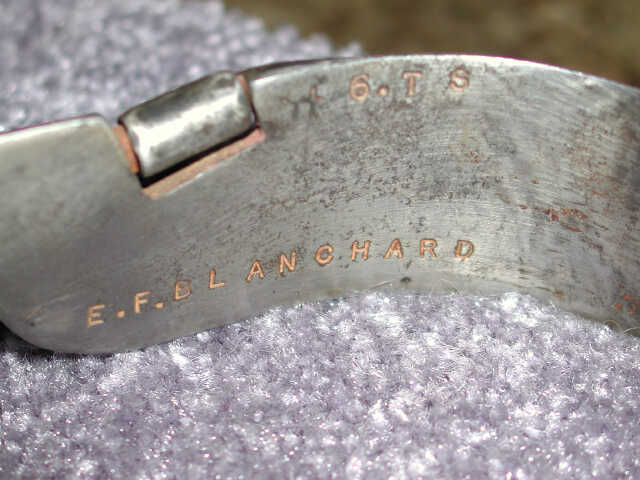 The mark is E. BLANCHARD DATIL N.M.
Spurs owned by Mike Laughlin. 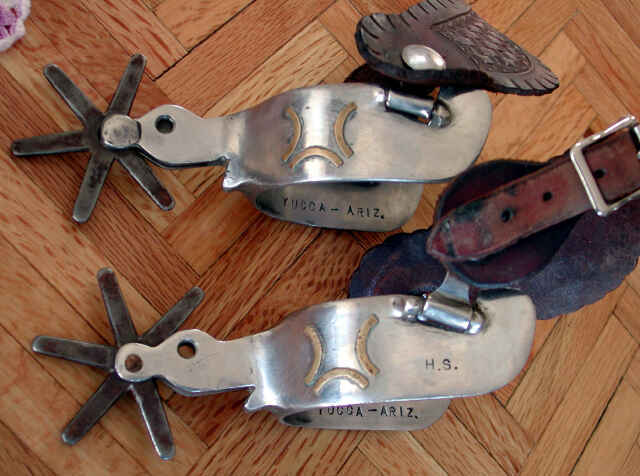 Two pair of San Antonio, New Mexico marked Blanchard spurs courtesy of Misty Pugmire. 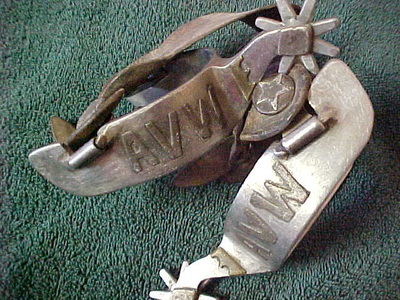 She says about the spurs, "The spur with AVW belonged to Audie (Dink) Van Winkle (my granddad) and one with the moons and star belonged to Jerry Van Winkle (my dad) They were a gift from Mr. Murphy on the Diamond Bar Ranch in Southern New Mexico in 1955 or 1956, my dad said. They now belong to my family." Shared by Ann Hathaway, Central Point, Oregon "I thought you might like to see the pair of Blanchard spurs I have, made for the man who taught me to ride-John Brunson- in the 40's or 50's, I don't know when for sure. 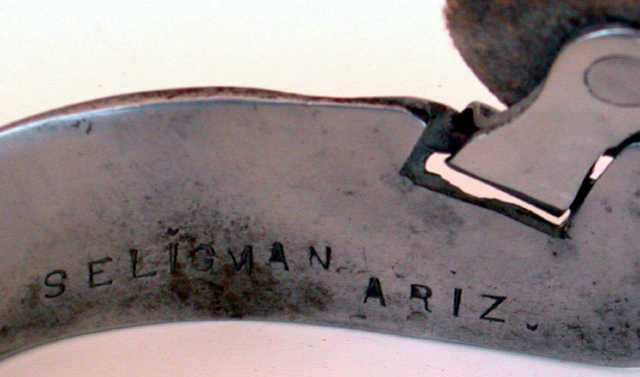 But they are marked Seligman, Ariz inside. 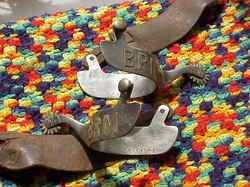 John Brunson was good friends with Don Dodge, and Slim Trent. 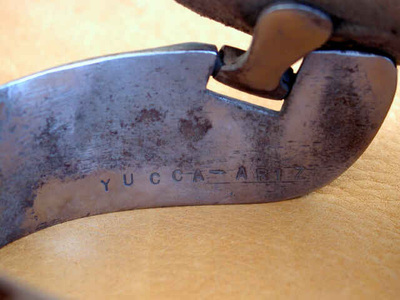 All were cutters in PCCHA. 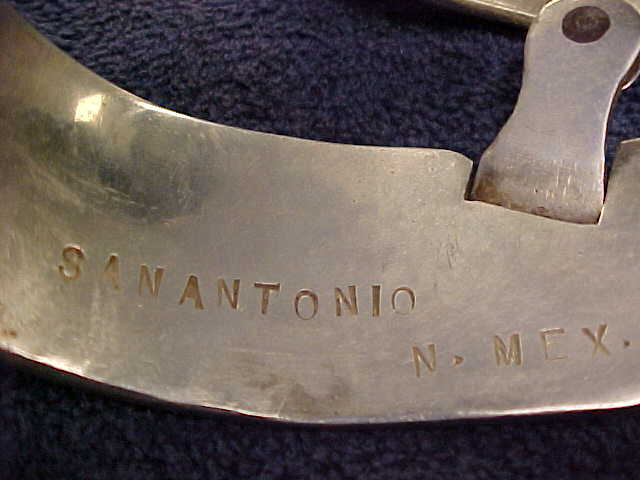 I think John had the spurs made while he and his wife lived in Tucson. They lived at SaRita and then out on the Benson Highway. 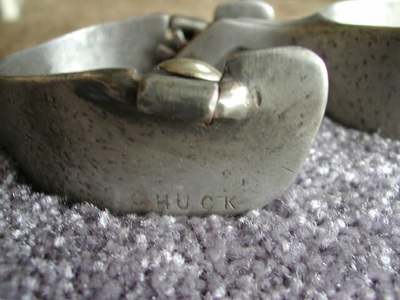 Of course, that was years ago, probably in the last of the 40's or the first couple of years in the 50's. 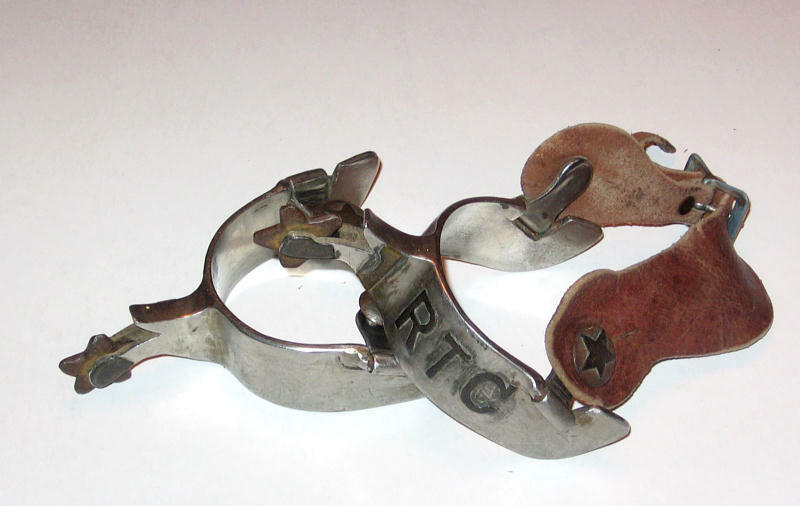 They then moved to Valley Center in So. Calif. and as I remember, Don Dodge used to come over to practice. Then John and Mildred moved to Fallbrook and there was a lot of cutting going on there. 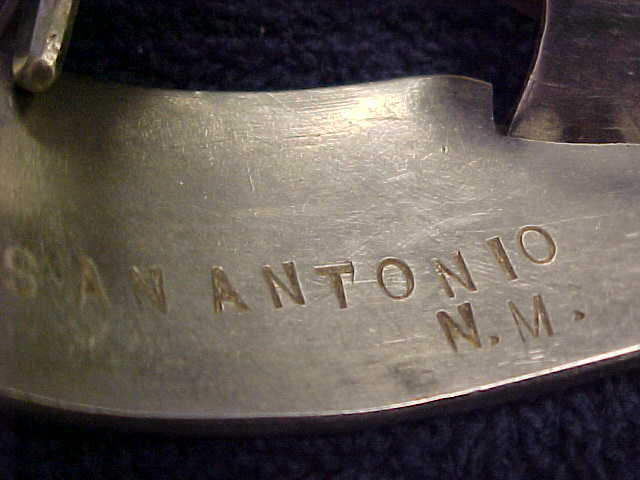 From there to Ramona and they both passed on at that location. John and Mildred were very close friends of my parents for many many years, and Mildred saw me in a laundry basket when I was 3 weeks old. I am now 61 so it has been a looooooooong time. 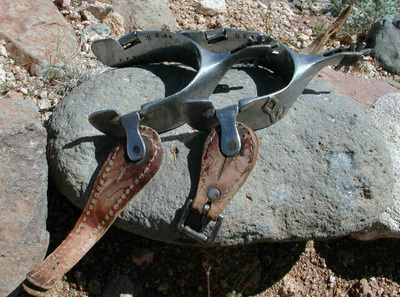 And I only wanted John's spurs when he passed on. 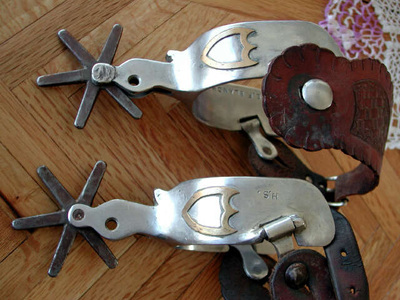 He helped me when I got my first horse and I used to follow him around like a puppy trying to learn all I could. Slim lived on the place in Valley Center and had 2 boys, Lonnie and Marvin. 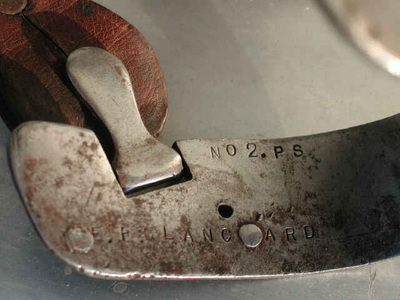 Lonnie had a terrible scar on the corner of his mouth where a stud bit him when he was really little. 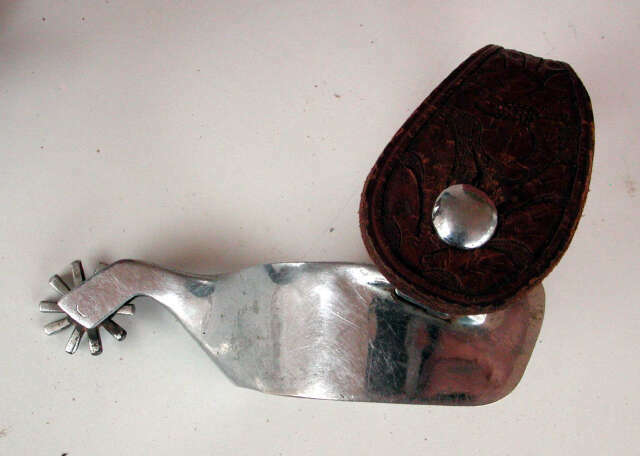 It was an interesting time. 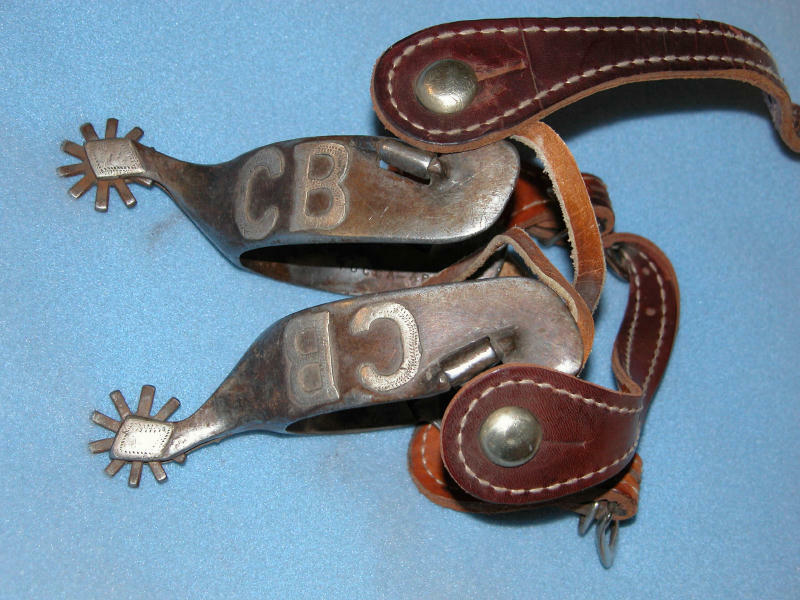 John and Mildred Brunson were very close friends and believe me when I tell you, those spurs will be with me until I die. 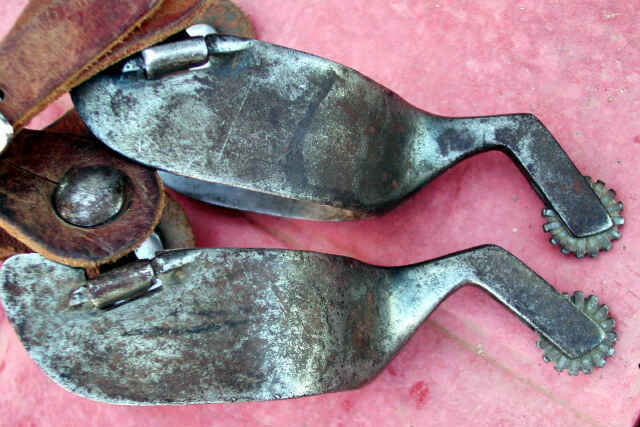 I also have a very old pair of Visalia's from my friend Joe Pike. 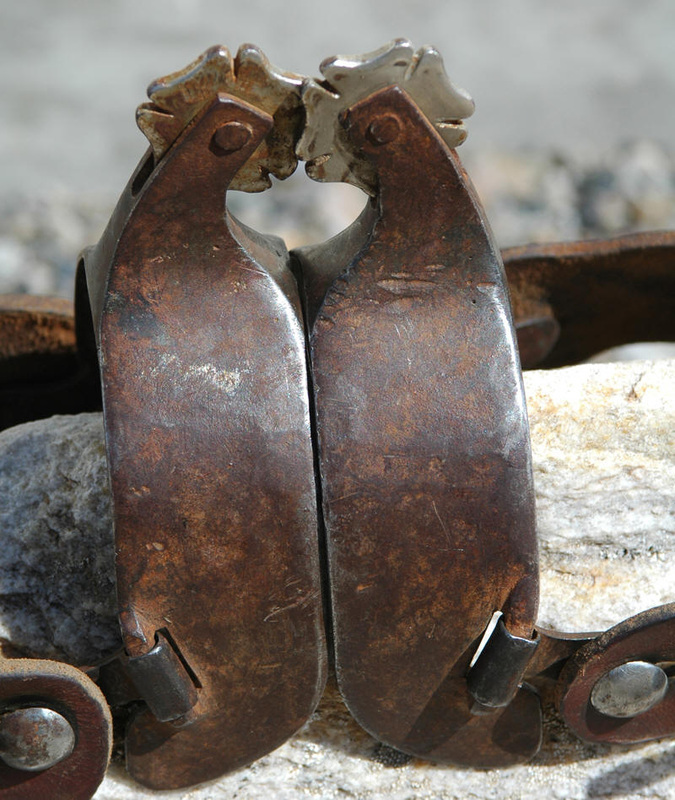 They are about 65 years old now and Joe died about a year ago. 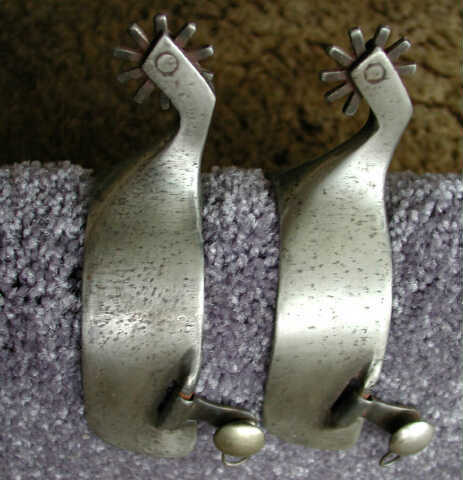 I have them hanging on my wall so I have two pair of "treasures". 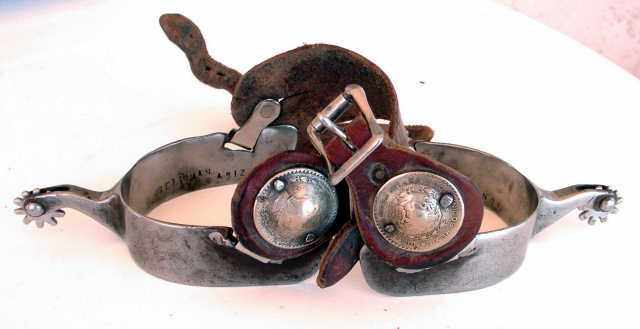 I suppose I have quite a bit of money in those two pair but if I sold them, it would be like selling my kids!!!" 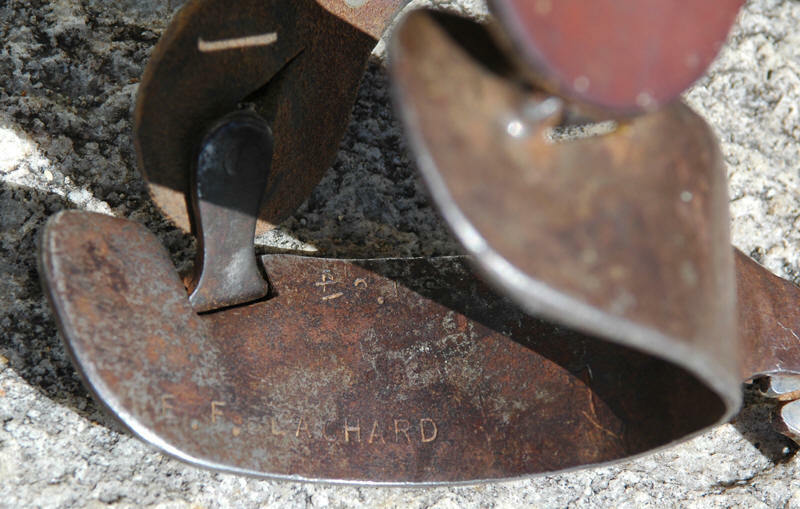 Well-worn pair of E. F. BLANCHARD SELIGMAN ARIZ. marked spurs belonging to Mike Laughlin. Buttons are Mexican un peso coins. 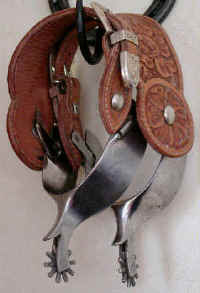 Silver mounted spurs owned by J.K. & M.E. 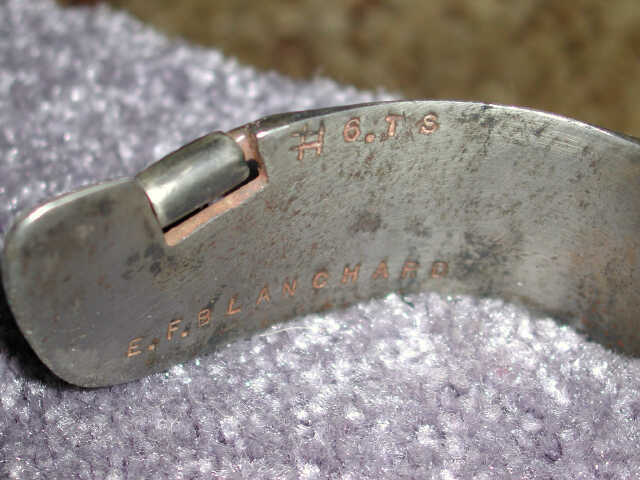 Rhoads, Raymond, CA. The silver engraving was added after-market by a famous California silversmith. 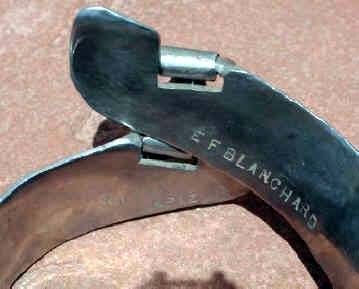 This is a photo of a pair of unusual Blanchard's that are said to have once been owned by Billy Simon. 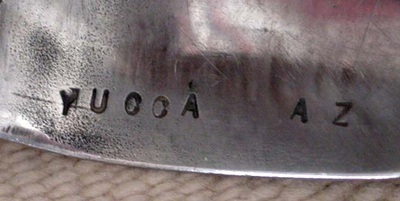 The spurs were purchased from Porter's and the silver work was done by McCabe. 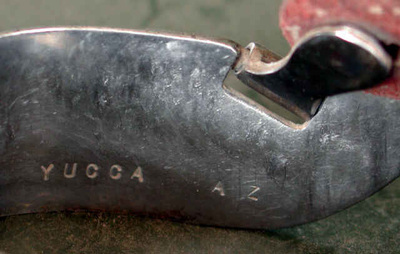 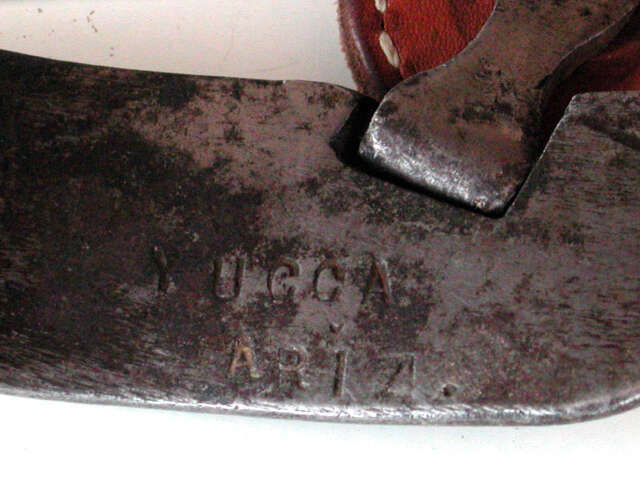 The buckles on the straps are marked with McCabe's marks. 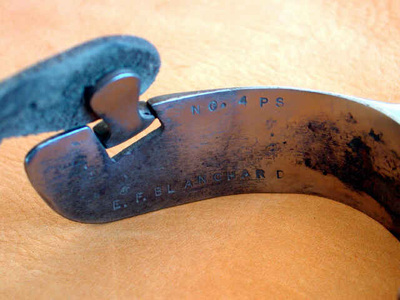 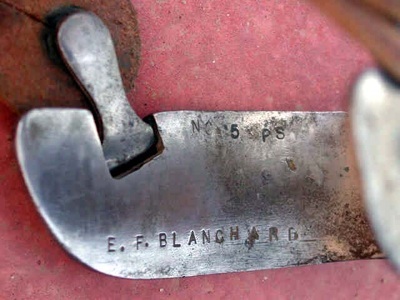 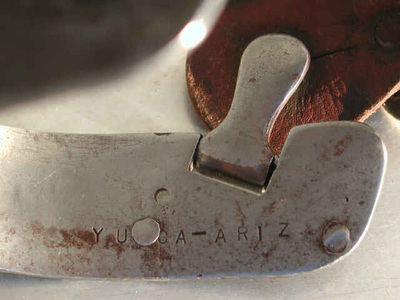 The spurs are marked E.F. Blanchard, Yucca, Ariz. No other marks inside the heel band. 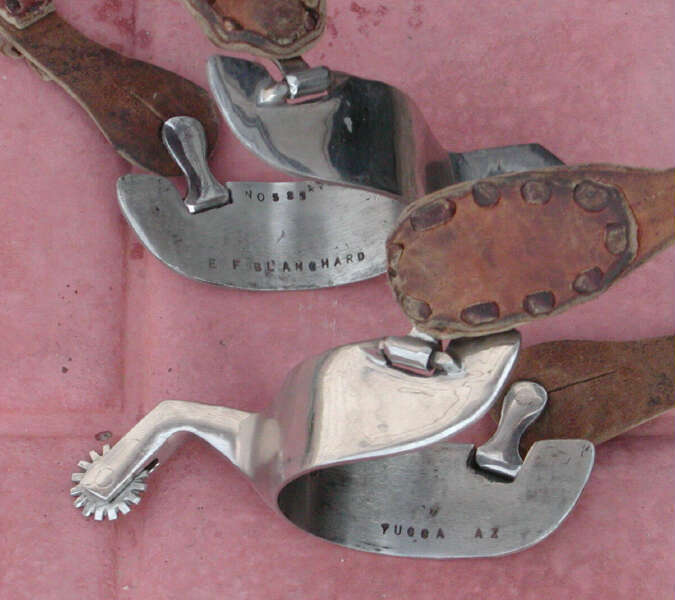 They are iron spurs. Courtesy of E D Allen. 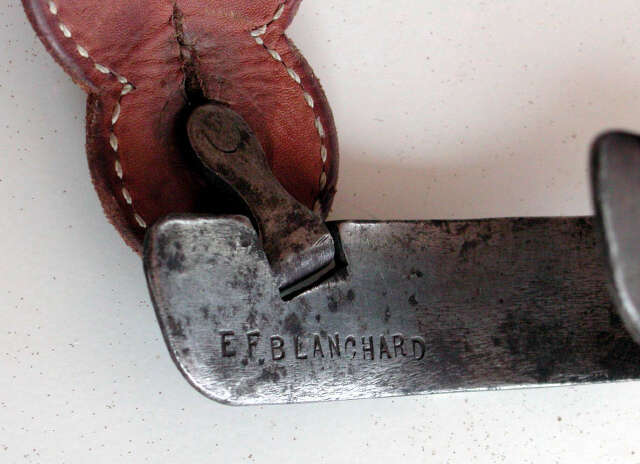 E.F. BLANCHARD #2. TS Courtesy of Cade and Mona Benson, Elizabeth, Colorado. Bobby Ray Martin has two pair of Blanchards. This unusual pair with stationary buttons was a gift, from his former boss at Arivaca Ranch in AZ. 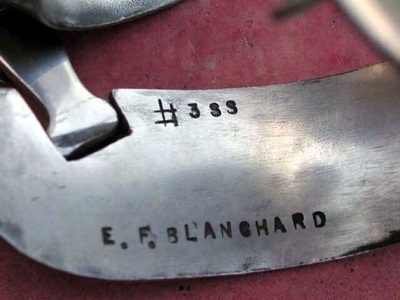 Martin worked for him for 15 years, and the boss had them custom made for Martin in1966. The initials on the spurs are BRM. These decorated stainless steel Blanchard spurs were won by Steve Medlin of the Medlin Ranch, Wickiup, Arizona, at the Kingman, Arizona Junior Rodeo in 1961. 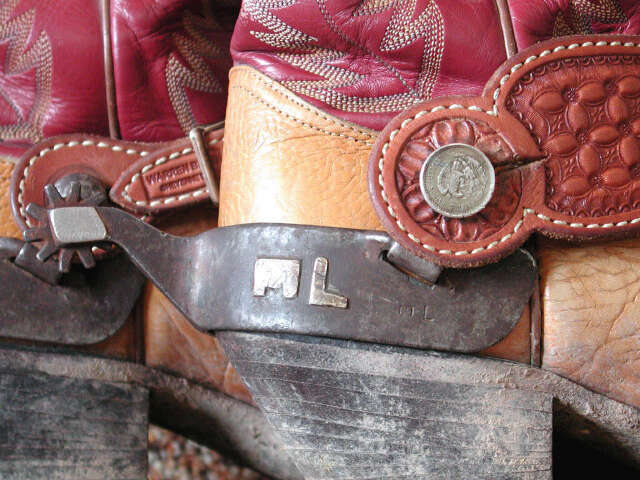 The Diamond W brand on the spurs is the Medlin ranch brand. They have no chap guard. 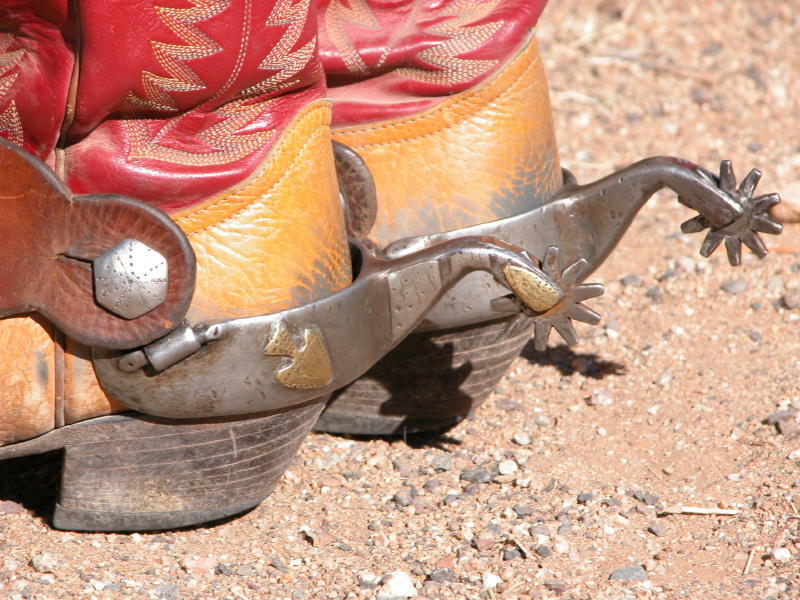 The spurs now belong to Audrey Hankins of Congress, Arizona. 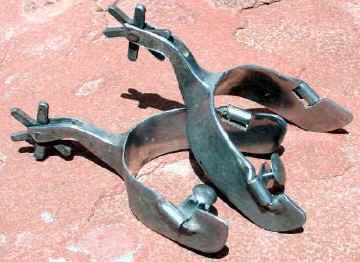 plain steel spurs. They show drill marks where someone apparently was going to put tie-downs and a great deal of wear. Spurs came out of Texas, unusual style of spurs for that area. 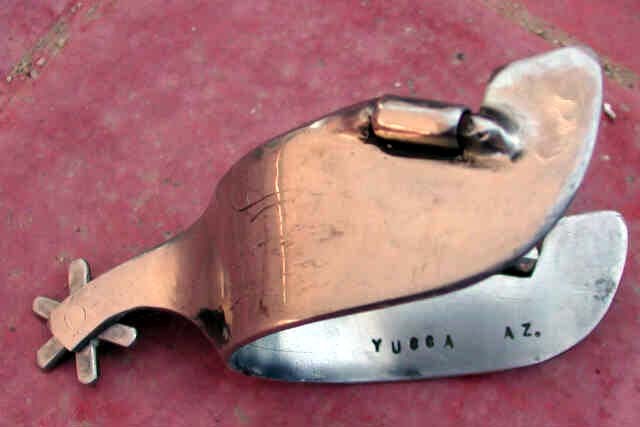 Owned by Mike Laughlin, Eureka, Nevada. Blanchard #3 Stainless steel spurs owned by Mike Laughlin. The #3 style were bronc spurs with short shanks and bronc rowels. 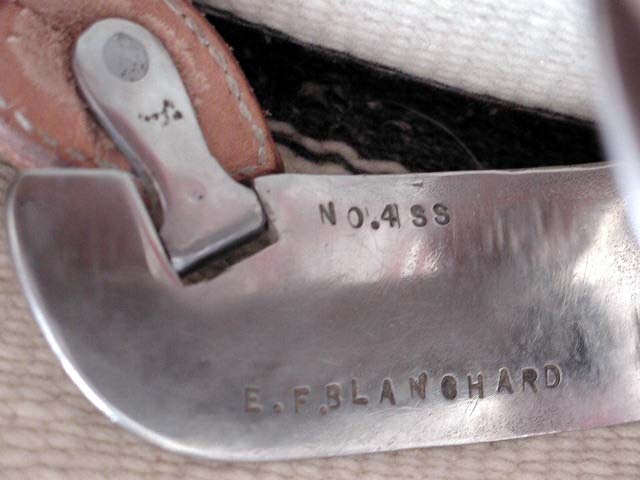 Marked E. F. Blanchard #3 SS YUCCA AZ. E. F. Blanchard #3. 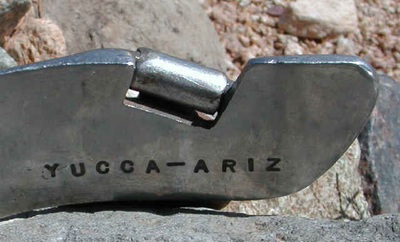 TS YUCCA-ARIZ, tool-steel bronc spurs owned by Mike Laughlin. 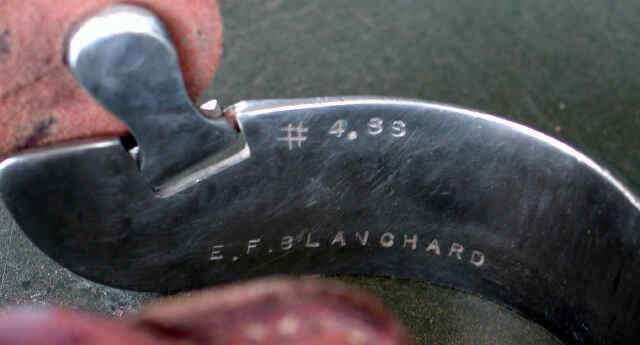 A set of Blanchard style #4's owned by Mike Laughlin. These are plain steel. 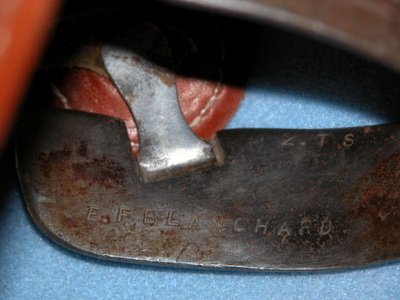 Note the chap guard. 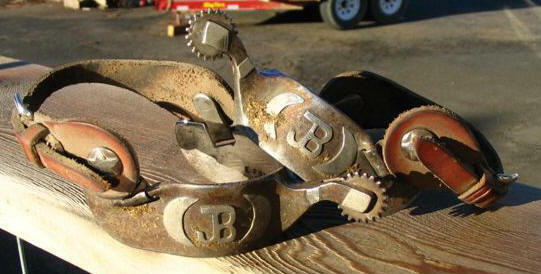 These spurs originally belonged to Bob Clark, Elbert, CO. Now owned by Mike Laughlin. 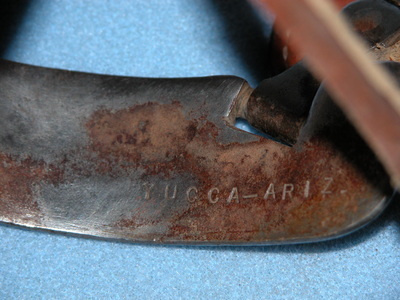 Spurs owned by Jim Stewart, Congress, Arizona. 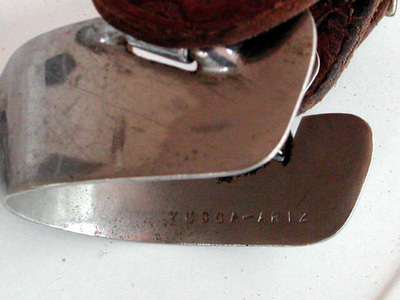 Stewart stamped his own name and Kingman ARlZ on the outside of the heel bands. Stewart was a cowboy in the Kingman area at the same time Blanchard was making spurs. 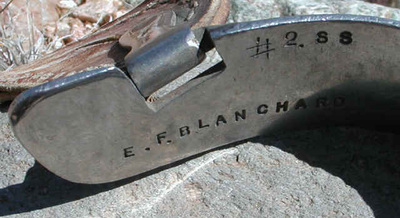 E. F. BLANCHARD #6.TS YUCCA-ARIZ A pair of Blanchard style #6 tempered steel spurs owned by the late Buster Aldred, Wetmore, Colorado. The name CHUCK is stamped on the outside of the band on one spur. 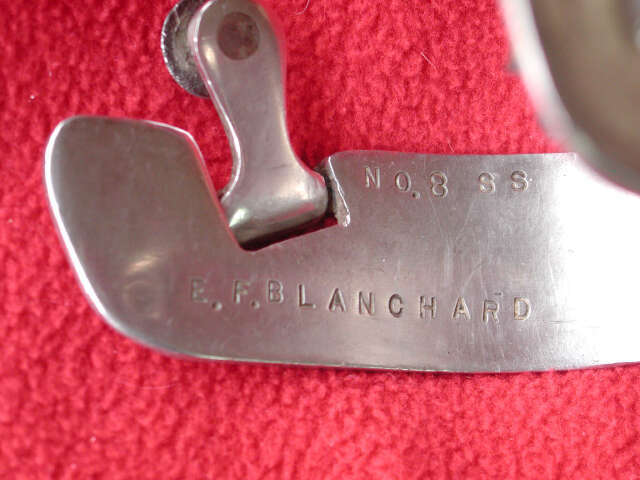 Blanchard style number 6 tool steel owned by Mike Laughlin. These spurs have been chrome plated. 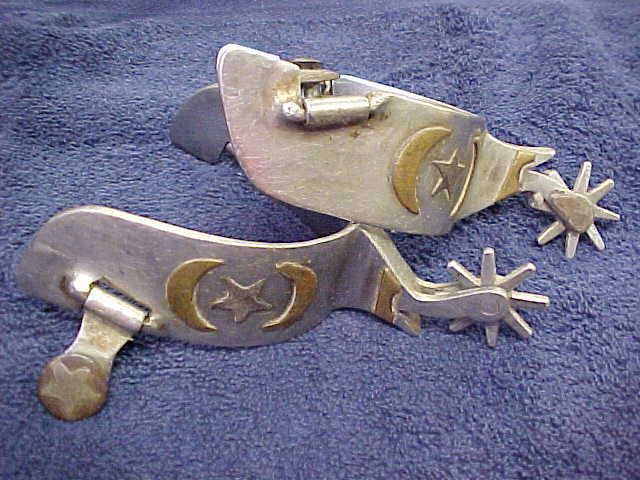 This custom pair of Blanchard stainless steel spurs was made for Harley Saddler of Miles City, Montana in 1959. Mr. Saddler drew out the shape and had his two ranch brands mounted on the heel bands. 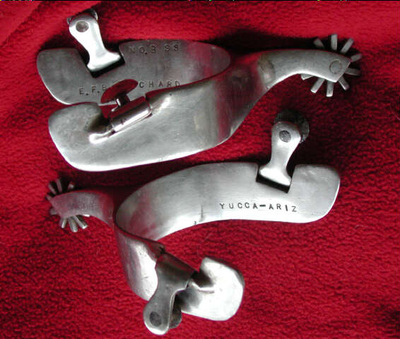 The rowels are replacements. 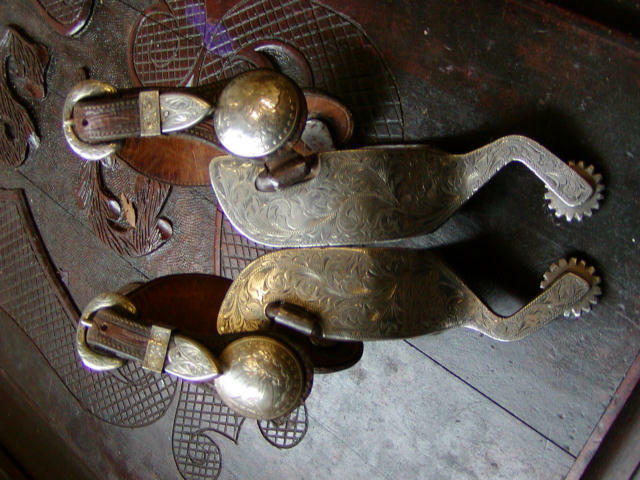 The originals, however, were also large and made of horseshoe nails, because he wanted "big rowels that rang." 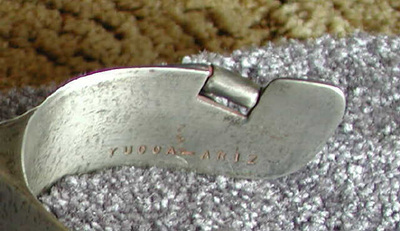 Note the hole in the shank where a pin can be placed to "stop" the rowels. 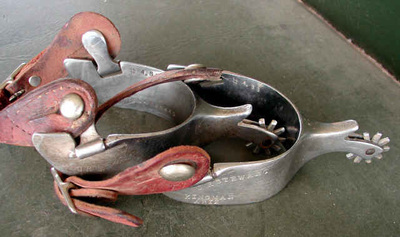 You stop the rowels from turning when you want to "get ahold" of a bronc or colt. 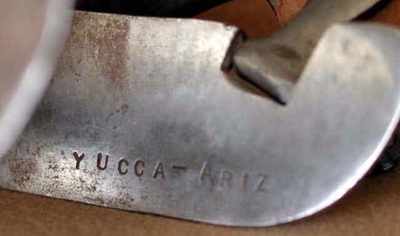 There is no number and the maker's mark is E.F. BLANCHARD YUCCA-ARIZ.